Photo: Jesús Renedo / GC32 Racing Tour - Video Icarus Sailing Media / GC32 Racing Tour. "...debut of Iker Martinez and Federico Ferioli.." !! So proud of my Argentine F18 fellow sailors about to race at the GC32 Tour. One thing leads to another and after F18 Worlds in BA, Lange winning Gold at Rio now we have a GC32 Arg team on the European Tour! Great challenge for Fede, Lucas, Cuco Benitez , Jason Hess and the rest of the 'ARG25' Código Rojo Racing Team. No wind today and light forecast for tomorrow at Fraglia Vela Garda, host Club pictured on Renedo pic above. 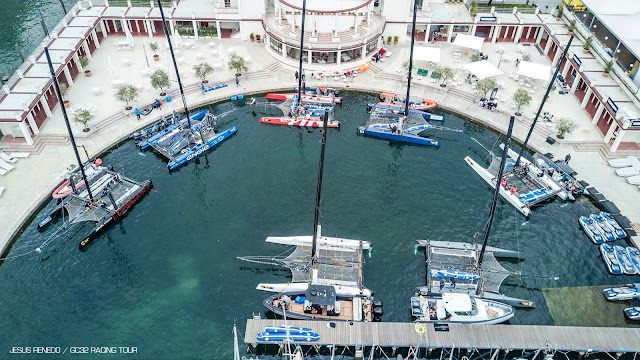 In stark contrast to the last few days when Lake Garda has delivered the brisk, flat water conditions for which it is famous, the opening races of the GC32 Racing Tour’s Riva Cup had to be put on hold due to a lack of wind. Late morning, the eleven GC32 catamarans ventured out of the Fraglia Vela de Riva, at the north end of Lake Garda, to the race area in a promising moderate southerly ‘Ora’ wind. Sadly just minutes before the first start, the wind vanished and a haze appeared on the lake, partially shrouding the towering mountains that surround Riva del Garda. After 40 minutes of waiting and no improvement, the AP over H flags were raised and the boats returned to the Fraglia Vela to remain on stand-by. Sadly the wind remained evasive for the rest of the afternoon.